Towerthon Elastomeric Coating is a high solids, internally plasticised, elastomeric coating formulated for use on masonry, concrete, prepared vinyl and aluminum siding, properly primed metal and primed wood. 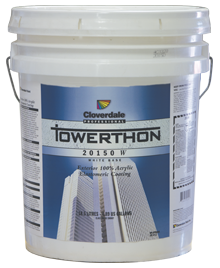 Towerthon's excellent elongation properties, even at low temperatures, make it the coating of choice for hairline or "spider web" cracked surfaces. It moves with the building, expanding and contracting to maintain a water-repellent barrier. The high elongation and recovery properties allow this product to bridge cracks up to 1/16 inch. Towerthon has excellent weathering and color retention properties and contains a fungicide for added mildew resistance on the dried film. Approved by the Master Painter's Institute under category # 40 and #113.